The forthcoming West Virginia State Budget continues to be insufficently transparent and accessable for citizen review. In addition to failing to tackle massive unfunded and growing budget liabities, it also has Constitutional flaws in regard to line item accountability. Some good news from this legislative session is that the Legislative Leaders finally backed off previous and spurious claims of no need for a special election for Governor as well as their fall-back preference for "insider" control through a political convention. Moreover, I and other delegates sponsored legislation to require a Special Primary election for Governor, thereby giving citizens a direct vote. The Special Primary election now is scheduled for Saturday, May 14th. Are you registered to vote? Other good news is the reduction of the grocery sales tax from 3% to 2%, even though the Speaker of the House of Delegates procedurally blocked an amendment proposed by me and thirteen other delegates, which would have completely eliminated the grocery tax. Even more good news is the final failure to pass HB 2946, which would have required doctors' prescriptions for common cold medicines. Voting for HB 2946 were Delegates Doyle, Duke, Lawrence, and Overington. Voting against HB 2946 were Delegates Cowles, Householder, Kump, and J. Miller (Roll Call Vote #196). Yet another bit of good news was the failure of a Constitutional Amendment to make it easier for local and county governments to pass non-school bonds and levies, thereby raising property taxes (SJR 9 & HJR 29). Delegates John Doyle and Tiffany Lawrence were sponsors of HJR 29. The worst bit of news was passage of SB 608, mandating an over $43 million increase in motor vehicle fees. Voting for SB 608 were Delegates Doyle and Lawrence. Voting against SB 608 were Delegates Cowles, Duke, Householder, Kump, J. Miller, and Overington. (Roll Call Vote # 342). Along with this bad news was that the Legislature also spent $100 million (SB 550) to buy new gambling machines for state approved betting parlors. Voting against SB 550 were Delegates Coles, Duke, Householder, Kump, J.Miller, and Overington. Delegate Doyle voted for SB 550 and Delegate Lawrence was excused from voting, inasmuch as she is employed by one of the recipients of this funding. Again, are you registered to vote? SJR 9, a proposed Constitutional Amendment which would have made it much easier for county and local governments to pass non-school bonds and levies (and thereby increasing our property taxes) was not brought to a final passage vote in the House of Delegates. Accordingly, SJR 9 will not go to the voters for a referendum vote and it will not become law. Note: Also visit the Friday, March 4th, 2011 "Legislative Action Alert!" entry for further details about SJR 9. Postscript: The House of Delegates' version of SJR 9 was HJR 29. Among HJR 29's sponsors were Delegates John Doyle and Tiffany Lawrence. For further details on this and all other legislation, go to "Links" on the right hand side of this website and click on "WV State Legislature". The Democrat majority of the West Virginia House of Delegates today approved an Obamacare "Health Insurance Exchange" system for West Virginians with final passage of SB 408 (Roll Call #379, 63-34). Eastern Panhandle Delegates voting for SB 408 were Doyle and Lawrence. Voting against SB 408 were Delegates Cowles, Duke, Householder, Kump, J. Miller, and Overington. This resolution (see above link to the West Virginia Legislative Website) was introduced on the floor of the West Virgina House of Delegates on Saturday, March 12th. However, the Speaker of the House did not allow it to be voted upon by the Delegates. On Friday evening, March 11th, legislators in the House of Delegates managed to vote in favor of both gambling away and increasing your taxes. SB 608 (Roll Call #342, 58-39) will grossly increase our motor vehicle fees for services and documents. (In the Eastern Panhandle: Delegates Cowles, Duke, Householder, Kump, J. Miller, and Overington voted NAY. Delegates Doyle and Lawrence voted YEA). West Virginia cannot afford to eliminate the grocery tax or provide proper upkeep of our roads, but can we afford to gamble away $100 million of tax revenue to promote gambling while increasing motor vehicle fees on those who can least afford it? Is this someone's idea of a sick joke? If so, I'm not laughing. 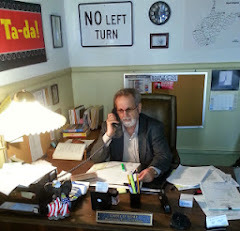 Arlington, Va.—The free market grassroots group Americans for Prosperity (AFP) today applauded West Virginia State Delegate Larry Kump (52nd District) for signing the group's "No Climate Tax Pledge." Kump joins over 500 lawmakers and candidates on the federal, state and local levels pledging to "oppose legislation relating to climate change that includes a net increase in government revenue." "The one thing elected officials should be able to agree on is that global warming shouldn't be used as an excuse to hike taxes on citizens and businesses," said AFP Vice President for Policy Phil Kerpen. "We encourage all of West Virginia's elected officials and candidates for elected office to sign the pledge." West Virginia signers include: U.S. Representative David McKinley; and State Delegates Troy Andes, Kelli Sobonya, Linda Sumner and Jonathan Miller. President Obama has made no secret of his support for a cap-and-trade energy tax, which would be the largest tax increase in American history. The non-partisan Congressional Budget Office scored a cap-and-trade scheme as an $846 billion increase in federal revenue, a burden that will be borne by taxpayers and consumers for decades to come. Analysis by the Institute for Energy Research found the tax cost the nation more than 500,000 jobs by 2015 and decrease household income by over $1,000 by 2020. "Using the guise of climate change to transfer dollars from hard-working citizens to bureaucratic big government is unacceptable," said Kerpen. "Regardless of their stance on global warming, this should be common ground for all of our elected officials at all levels of government." The pledge is available online at www.NoClimateTax.com. AFP does not endorse candidates. All elected officials and candidates are encouraged to sign the pledge and go on the record in opposition to using the climate change issue to increase taxes and grow the size of government. Americans for Prosperity does not support or oppose candidates for public office. The West Virginia Senate today rejected final passage of HB 2946. See "More on Meth", "Sudafed Up? ", and "Legislative Session News Report #7" entries at this website for more details about this legislative proposal. The West Virginia Legislature now is racing to finish passage of legislation by Midnight, Saturday night, and many of the major issues will remain unresolved until the last stroke of the clock. The Legislature will continue to meet during the following week to approve the final version of the annual state government budget for the coming year. Meanwhile, the Senate has resurrected the immediate reduction of the grocery tax from 3% to 2% by amending HB 2971. When the Senate's action on HB 2971 was brought to the House of Delegates for a vote on Wednesday evening (March 9th), I and thirteen other delegates authored another amendment to completely eliminate the grocery tax. Sadly, the Speaker of the House of Delegates ruled this amendment attempt as out of order, so I and an overwhelming majority of the House of Delegates subsequently voted to concur with the Senate's amendment to HB 2971 in order to at least reduce the food tax from 3% to 2%. It now is expected that Acting Governor Tomblin will sign HB 2971 into law. In other developments, I have met with the Attorney General's Chief Deputy regarding the need to protect West Virginia's right to access our Potomac River water resource. The Potomac River jurisdiction long has been claimed by Maryland, even though the West Virginia watershed contributes 23.8 % of the water to that river. More to come, including public meetings between the Attorney General and local stakeholders on this issue. Also, in regard to post legislative session "Interim Studies" by the Legislature, I have proposed that the Senior Citizens Issues Committee investigate the effect of West Virginia laws and regulations on our senior citizens, including an analysis of the size and growth of West Virginia's elderly population as well as a comparison to that of other and surrounding states. In regard to citizen protection against fraud, I am working with the Attorney General Consumer Protection Division. Furthermore, their Senior Citizens Liaison, Julia R.Stevenson, has invited senior citizens with individual concerns and problems to contact her directly at (304) 636-6466 or (800) 368-8808. The Legislature soon again will assemble in a special session this Spring to approve new citizen voting districts for West Virginia's Senators and Delegates. These new voting districts will be based on the population change results from the 2010 census. During that session, I will work in favor of creating voting districts that more reasonably reflect and represent the folks in local communities, instead of designing districts to protect the re-election of incumbent legislators and the special interests of political parties. nonpartisan elections in West Virginia (see previous 1/25/11 entry, "More Good Governance Initiatives"), and will continue to pursue this elevation of citizens over political parties. the notion of political parties, and perhaps it's now past time for us to revisit their concerns. Methamphetamine Precursors. If Existing Laws Enforced, New Laws Not Necessary! Beckley, W.Va. —Today, Jim Mullins, an attorney in private practice in Beckley who serves clients throughout the State of West Virginia, urged the West Virginia Senate to reject House Bill 2946, and instead demand more aggressive enforcement of existing state laws regulating various methamphetamine precursors. On Wednesday, March 2, 2011, the West Virginia House of Delegates passed House Bill 2946, which would require a person to obtain a doctor's prescription before a person could purchase numerous over-the-counter medications that contain pseudoephedrine or certain other drugs that are associated with the manufacture of methamphetamine. extremely dangerous process of manufacturing meth. Mullins says HB 2946 is entirely unnecessary and will only burden frequent cold & allergy sufferers who will be forced in many cases to switch to less-effective medications when less-restrictive alternatives exist. He said: In 2005, the Legislature passed the Methamphetamine Laboratory Eradication Act. As part of this law, the Legislature extensively regulated the sale of numerous over-the-counter cold medicines. These regulations simply are not being enforced. Instead of enforcing the current law, our public servants who have the legal responsibility to enforce the law have instead chosen to seek new, more restrictive laws rather than make the current laws work. West Virginia Code § 60A-10-4(a) provides that "[a]ny person who within any thirty-day period knowingly purchases, receives or otherwise possesses more than three packages of" certain regulated drugs is guilty of a misdemeanor punishable by up to a year in jail and/or a $1,000 fine. A second or subsequent offense is a felony. The same section also provides that "any person who knowingly possesses any amount of" any of the same regulated drugs "with the intent to use it in the manufacture of methamphetamine or who knowingly possesses a substance containing" any of the same regulated drugs "in a state or form which is, or has been altered or converted from the state or form in which these chemicals are, or were, commercially distributed" is guilty of a felony punishable by up to 10 years in prison and/or a $25,000 fine. West Virginia Code § 60A-10-5 requires the same regulated drugs to be kept behind a pharmacy counter, prohibits their sale to minors, and requires a person purchasing any of them to show a photo ID and sign a sale registration form. West Virginia Code § 60A-10-8 requires each registration form to include the date of the transaction; the name, address, and driver's license number of the purchaser;and the name, quantity of packages, and total gram weight of the regulated drugs purchased. Moreover, that section requires this information to be regularly reported to and retained by the state Board of Pharmacy. There is simply no good reason why the state Board of Pharmacy should not have created and maintained a fully-functional database of the information collected on the same of the regulated drugs, as required by the Legislature in 2005. The Legislature intended for the Board of Pharmacy to create and maintain this database for use by the Board and local law-enforcement agencies, prosecuting attorneys, and responsible pharmacies to detect and apprehend individuals illegally stockpiling regulated drugs. The information in this database should be able to alert the appropriate agencies when certain individuals have purchased large amounts of regulated drugs. In turn, this information should be used by law-enforcement officials to obtain video surveillance from each pharmacy confirming the identity of the individual(s) involved, which should lead to criminal prosecutions under the current law. Furthermore, in 2006, Congress passed the Combat Methamphetamine Epidemic Act of 2005, which enacted many of these same regulations under federal law. Unlike West Virginia's law, the federal law did not mandate the maintenance of centralized electronic tracking databases. However,unlike state law, the federal law contains far more severe penalties for individuals who knowingly make false statements when purchasing one of the regulated drugs: a felony punishable by up to 5 years in federal prison and/or a $250,000 fine. The federal law does not preempt more restrictive state laws or more aggressive means of enforcing parallel state laws. In many cases—as already happens with other crimes where both state law and federal law are involved—there could be collaboration among federal, state, and local officials to use federal law enforcement, judicial, and corrections resources to partially relieve our state of the burden of dealing with the meth problem alone. For these reasons, the Legislature must avoid the easy way out and instead demand that the laws on the books now be enforced before new, more restrictive laws are passed. Over the course of many years, I have personally lobbied the Legislature on behalf of various pro-freedom causes where individual rights have faced opposition from well-meaning but misguided opposition that have sought to combat various social and public safety problems with laws that do more to restrict the personal freedom of honest, decent, law-abiding individuals rather than focus the efforts of government more closely upon the sources of the problems at hand. Before the Legislature drops a sledgehammer on lawful users of regulated cold medicines, fellow West Virginians need to know whether the state Board of Pharmacy has complied with the Legislature's 6-year-old mandate to create an electronic tracking database. If this database is being operated in compliance with the Legislature's mandate, why is it not being used to identify the individuals who are allegedly driving from one pharmacy to another, amassing large quantities if regulated drugs for making meth? No one should deny that effective enforcement of the current law may well be a time-consuming task that will require more financial resources and personnel to effectively combat the current meth problem. The alternatives are to either tolerate a further breakdown in law and order or pass new, more restrictive laws that will severely inconvenience legitimate users of the regulated medications and whose enforcement simply cannot be taken credibly in light of apparent lack of enforcement of what I believe are more than adequate state and federal laws. If, in fact, aggressive enforcement of the existing state laws would be too great a burden on state and local law enforcement and judicial resources, why has there not been sufficient collaboration with federal law enforcement agencies to seek federal prosecution of individuals who are violating largely identical federal laws? The state Senate has a choice: it can do the seemingly easy thing and pass HB 2946 and the Legislature can bask in self-congratulatory praise for "doing something" or they can do the right thing and insist upon the enforcement of a good law passed 6 years ago that seems to have been all but ignored if we are to believe all the hype surrounding HB 2946. Our fellow West Virginians deserve better. Also check on the other entries on this issue ( 3/10/11 "Sudafed Prescription Bill (HB 2946), 3/5/11 "Sudafed Up? ", and 3/3/11 "Legislative Session News Update #7"). I heard that the House passed a bill to make it necessary to have a prescription in order to purchase Pseudofed.... which I already have to show an ID for. 1) I will just make my purchase of pseudofed in Maryland or Virginia as we use this medication for sinus/congestion conditions in my house... rather than the more common use(?) of purchase for making methamphetamines, or so it would seem. 2) My husband used to have a prescription for Clariton-D... then it became OTC... now it will be prescription again? (Will my insurance company pay for it then as it will not currently pay for it because it does not require a prescription?) So now, in order to get the medication for my husband (which, BTW, his Doctor suggested) I have to make a $65 doctor appointment (now that my deductible is very high, I will pay that out of pocket) in order to get the same medicine? 3) Once again, I feel that I am being unfairly burdened because some people are abusing something. It's like leaving SAM's club and being subjected to a bag search, in case I have stolen something... not because I have, but rather because some people have... so now we all have to be treated like criminals in order to not discriminate against the criminals? Not making my life easier Larry!!!! Note from Delegate Kump: Check the other entries on this and other topics. For even more legislative information, as well the vote on HB 2649 in the House of Delegates and how to contact your legislators, click on "WV State Legislature" (on the right hand side of this page, under "Links"). HB 2649 now is pending a vote in the Senate. With only a week left in the Legislative session, most proposals have not survived, although there remains a possibility that some of them will be resurrected in last minute wheelings and dealings during the coming week. Meanwhile, the deadline now has passed for legislative bills to be approved by their orginating chamber (House or Senate). The House of Delegates and Senate now will concentrate our remaining time on voting on bills that already have passed the other chamber. The Democrat proposal for an additional tax of $1.00 a pack on cigarettes as well as a proposal to diminish West Virginia's electoral status in Presidential elections did not pass. Democrats in the West Virginia House of Delegates also voted to refuse consideration of their own proposal to reduce the sales tax on groceries (HB 2649, Roll Call Vote #152). Voting in favor of reducing the grocery tax were Delegates Duke, Kump, and Overington. Voting against further consideration of reducing the grocery tax were Delegates Doyle and Lawrence. HB 2732, to increase court fees to provide political campaign contributions to candidates for election to the West Virginia Supreme Court, passed the House of Delegates by a vote of 65 to 35 (Roll Call # 191). Voting against HB 2732 were Delegates Cowles, Duke, Householder, Kump, J. Miller, and Overington. Voting for the fee increases were Delegates Doyle and Lawrence. HB 2946 requires the ingredient pseudoephedrine in the cold medication "Sudafed" to become only available by higher cost medical prescriptions. It also subjects those who obtain or have it without a doctor's prescription to possible criminal charges. HB 2946 passed the House of Delegates by a vote of 77-23 (Roll Call #196). Voting for HB 2946 were Delegates Doyle, Duke, Overington, and Lawrence. Voting against HB 2946 were Delegates Cowles, Householder, Kump, and J. Miller. One of the authors of HB 2946, Delegate Don C. Perdue (D-Wayne County), in a speech to persuade Delegates to vote for this proposal, pointed out that pseudoephedrine sometimes is used to make illegal drugs. He then went on to further recommend passage of HB 2946 by using "Communist China" as an example of enforcement efforts against drug offenders. There will be much activity and some surprises during the upcoming final week of the Legislature.